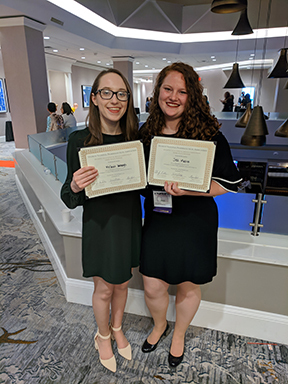 PittPharmacy students Melanie Umbaugh and Jessica Mattox (Class of 2021) were awarded third place in the Kroger/Student National Pharmaceutical Association Clinical Skills Competition at the Region 1 and 2 Conference at Howard University in Washington DC, February 2019. The duo earned their third place spot out of 40 teams, and were the only winners from Region 1. The competition consisted of a 5 minute review of a patient case, followed by a 5 minute encounter with a standardized patient. During the time with the patient, students relayed new prescription counseling, assessed the management of chronic conditions, identified and corrected any drug therapy problems, and provided an OTC recommendation.